Learn how to fully utilise industry leading technical applications from Microsoft. Browse the full list of our Microsoft Technical training courses. Find out more about Microsoft Technical Certification Training. Whether you’re an established professional or new to the field, Microsoft IT training will give you the expertise you need in a specific product or technology. When you learn from our Microsoft Certified Trainers, you can be confident that what you’ll learn will be accurate, complete and up to date. Why Choose NILC For Your Microsoft Technical and Certification Training? NILC’s Microsoft Technical and Certification courses are available in locations throughout England and Wales and are regularly held in our training venue’s in Newport and Cardiff. The course fees include course materials, refreshments and a post-course support. All of our Microsoft Technical IT training courses can be delivered and run at your offices if you wish. 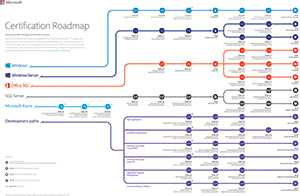 Choose your preferred Microsoft Certification path.